Lauren Rebecca: Cheers To Holiday Drinks! For Kids: In a shaker, mix 4 oz. cranberry juice, 1 oz OJ, and 1 tsp. honey; shake, then pour over ice. Top with a splash or two of child club soda and a cherry. For fun, use a striped paper straw! For Kids: Stir together 4 oz. organic apple juice, 1 tsp. fresh lemon juice, and 1/2 tsp. grenadine syrup. Pour over crushed ice and garnish with an apple slice. For adults: Sub 1 oz. of apple juice with rum. For Kids: Combine 3 oz. low-fat milk, 2 oz. French vanilla half-and-half, a drop of peppermint extract, vanilla extract, and green food coloring. 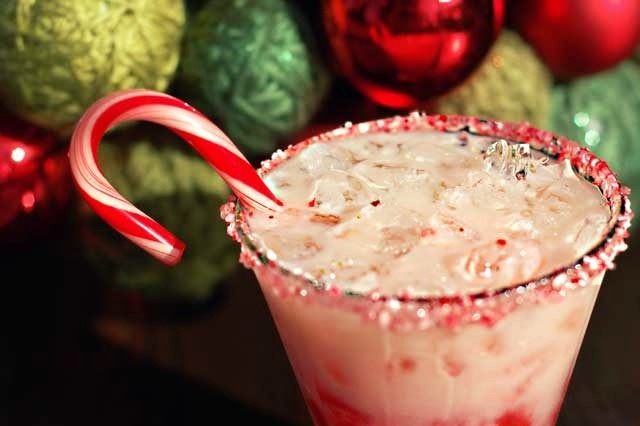 Shake and strain into a glass rimmed with crushed candy cane. For adults: Sub in 1/2 oz vodka and 1 1/2 oz. Bailey's Original for the half-and-half.